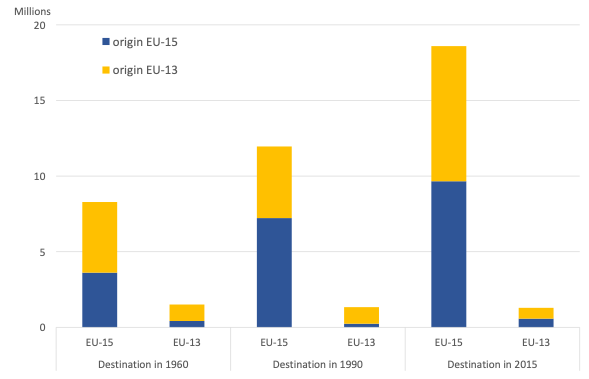 Figure 1 illustrates the number of migrants in the EU15 and EU13 in 1960, 1990, and 2015 by destination. The migration stock more than doubled between 1960 and 2015, from around 10 million migrants to 20 million (the sum of the bars for the EU15 and EU13). The increase is both absolute and relative: the share of intra-EU migrants increased from less than 3% to 4.5% of the total population. Source: Rojas-Romagosa and Bollen (2018). Figure 1 also shows that the vast majority of intra-EU migrants chose the EU15 as their destination. Almost all the changes in migration are generated by people from everywhere in the EU migrating to the EU15 (note that there were already almost 5 million EU-13 migrants in the EU-15 in 1960). When looking at the region of origin, intra-EU migration is more balanced between the EU15 and the EU13. In 2015, for instance, around 10 million migrants came from each region. We employ a structural gravity model to identify the impact of the free movement of people on migration in the EU. Our model is based on the canonical random utility maximisation model of migration, following recent literature that estimates the determinants of bilateral migration (Beine et al. 2016). In particular, we include country-time fixed effects, which can account for country-specific changes that can also affect migration flows (for example, economic growth, unemployment rates, or internal policy changes) in both the country of origin and destination. Importantly, we also employ country-pair fixed effects to account for the impact of bilateral time-invariant observed and unobserved migration determinants including geographical and cultural distance, language, institutional and legal settings. This has the advantage that we can separate the effect of bilateral time-varyingfree movement of people policy implementation from other bilateral time-invariantdeterminants of migration. On the other hand, when we use country-pair fixed effects, we cannot distinguish the effect of other time-invariant indicators, such as income gaps between countries, which have been found to be one of the key determinants of migration (Beine et al. 2016). Finally, this econometric setting also allows us to identify within-EU group specific and even country-specific impacts of the implementation of the free movement of people. Our main finding is that the implementation of the free movement of people principle had, as expected, a positive and significant effect on bilateral intra-EU migrant stocks. Intra-EU bilateral migration stocks increased 28% on average after the implementation of the free movement of people. Since intra-EU migration between 1960 and 2015 doubled (see Figure 1) our results suggest that free movement explains around one-quarter of the total migration stock changes in this period. The implementation of the free movement of people is one of the main factors explaining the migration shifts within the EU during this period. Notes: 'n.s.' stands for non-significant estimated effects. Sources: Authors' estimates using the combined World Bank and UN bilateral migration databases. The estimate of 28% is an average for all EU countries that have implemented free movement. In other words, it provides the average effect of free movement on migration stocks, irrespective of the destination or origin countries involved. There is, however, substantial migration heterogeneity within the EU. To analyse within-EU differences, we re-run our estimates using subsets of the free movement dummy variable. In Figure 2 we present the estimated percentage impact of the free movement of people on migration stocks for different within-EU group-specific settings. We find that the impact of free movement is higher (40%) when the EU15 is the destination, and there is no significant free movement effect when the destination is the EU13. The effect of free movement on EU13 to EU15 migration (48%) is also larger than the average for all EU countries (28%). Surprisingly, however, when an EU13 country is the origin, the free movement coefficient is not statistically significant. This is a consequence of citizens from EU13 countries migrating away from other EU13 countries, which is reflected in a relatively large and negative free movement coefficient for EU13 to EU13 migration (-54%). Therefore, the positive EU13 to EU15 effect is counterbalanced by a negative EU13 to EU13, making the average EU13 as origin effect positive, but not statistically significant. On the other hand, EU15 as origin has a positive and significant effect (35%), since the free movement estimates show citizens from the EU15 migrating to all sub-regions. In particular, the largest free movement effect comes when migration is from EU15 to EU13 (162%), while the EU15 to EU15 effect is very close to the average (28%). Nonetheless, the very large EU15 to EU13 effect is hard to see, because the there is a relatively small initial EU15 migrant stock in the EU13. Finally, migration between and within non-EU countries that have implemented free movement (Iceland, Liechtenstein, Norway and Switzerland) is positive and significant (47%, not shown in Figure 2). These results are robust to different specifications and other sensitivity tests (for more details see Rojas-Romagosa and Bollen 2018). We estimate the impact of the free movement people to be significant and to account for one-quarter of migration. Other migration determinants, such as wage differentials and distance (geographical, linguistic and cultural) are even more important factors. 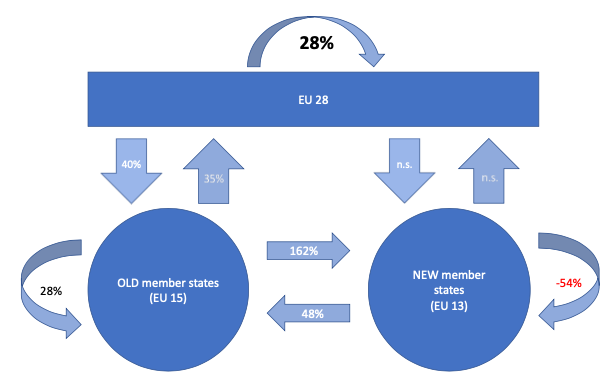 In particular, wage differentials explain the migration to old member states (EU15). Our methodology cannot estimate the intra-EU27 migration resulting from the UK leaving the EU, but it can approximate the effects of that decision on migration in the UK. Beine, M, S Bertoli, and J F-H Moraga (2016), “A Practitioners’ Guide to Gravity Models of International Migration”, The World Econom y39(4): 496–512. Özden, C, C R Parsons, M Schiff, and T L Walmsley (2011), “Where on Earth is Everybody? The Evolution of Global Bilateral Migration 1960-2000”, World Bank Economic Review 25(1): 12–56. Rojas-Romagosa, H, and J Bollen (2018), “Estimating migration changes from the EU’s free movement of people principle”, CPB discussion paper 385. United Nations (2015), “Trends in International Migrant Stock: The 2015 Revision”, UN Database POP/DB/MIG/Stock/Rev.2015, Department of Economic and Social Affairs, Population Division. The EU-13 includes: Bulgaria, Croatia, Cyprus, Czech Republic, Estonia, Hungary, Latvia, Lithuania, Malta, Poland, Romania, Slovakia and Slovenia. In addition, we also estimate the impact of the membership of the no-border Schengen area, which is different to FMP and includes different members. The use of these databases, on the other hand, has the disadvantage that it does not provide additional information on the characteristics of the migrants, such as age (or age group), working status, and educational (or skill) level. In particular, we cannot isolate the working age population from students and children that migrate for reasons other than finding a new job. However, comparing databases with additional migration details (for instance, OECD, 2015), we find a high correlation between the total population and the working age population. Participation in the no-border Schengen area, on the contrary, does not have a significant effect on bilateral stocks. This can be explained because the migration incentives provided by the FMP are much stronger than those granted by Schengen membership and thus, should have a much larger expected effect on the migration stocks.